Despite being a short week for most, this has been one of the more bountiful weeks for apps in recent memory. While such notable releases like the iPad release of the immortal “Knights of the Old Republic,” a long overdue great Warhammer gaming app in “Warhammer Quest,” and the creatively exciting music creation app “Musyc,” all deserve recognition, there is one that deserves it even more, for several reasons. “NarcoGuerra” is a “Risk” like strategy game that sees you take tactical control of the Mexican police force, as they fight their war against the drug cartels plaguing the nation. 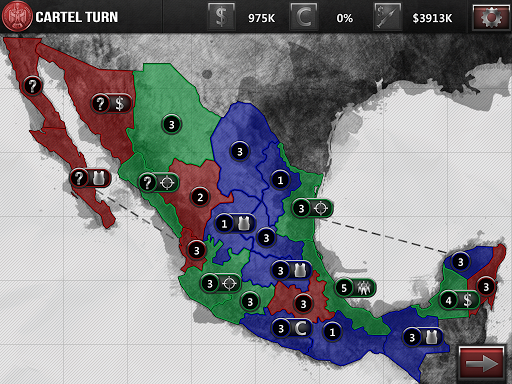 To do so, you will need to gather intel, battle corruption, and take over cartel controlled and disputed territories all while defending your own via troop distribution and mastering a (initially) simple numbers system. Victory is achieved when you have rid Mexico of the cartel. Except, just as in real life, it’s never quite that easy. The developer’s larger purpose in “NarcoGuerra” is to make people aware of the astoundingly violent and never ending war that is the real cartel battle in Mexico. To do so, they have made the game’s main mode punishingly difficult, and yes even a bit unfair. Just when you think you’ve got everything under control (which is rare), suddenly corruption destroys your efforts from within, or you’ll be betrayed by bad intel, delayed by the death of a major commander, or stunned by the rise of a new cartel power. The better you do in “NarcoGuerra,” the tougher the cartel pushes back, making defeat most prevalent, the closer you get to victory. “NarcoGuerra” uses an un-winnable war as a perfect backdrop to a tense and exciting strategy game that remains a challenge despite whatever mastery you may perceive you have of the proceedings. You may never beat “NarcoGuerra,” but you are also unlikely to tire of fighting the good fight, thanks to some rewarding, ambitious, innovative, difficult, and (somewhat ironically) addictive gameplay. While the still entertaining multiplayer and skirmish modes are focused on providing a more “video game” experience, it is the main story mode that is the draw. It focuses on a real world horror that deserves more attention, and uses it to enhance what is at its core, one of the most intelligent and entertaining mobile strategy games available. “NarcoGuerra” could have been a blunt political message thinly disguised as a video game, but instead it is a strong and important statement that takes the form of my app of the week.